This instrument will test the adhesion and brittleness of dry coats of paint on their substrate. Four types of circular blades, each having different blade spacings, are available: 1.0mm blade spacings, 1.5mm blade spacings, 2.0mm blade spacings and 3.0mm spacings. 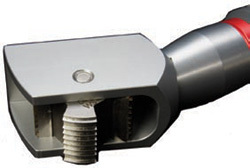 Also available are two types that have eleven circular blades each having spacing of 1.0mm or 1.5mm. The eight sets of circular blades are contained in one very compact cutter wheel. If one circular blade or area becomes worn or nicked the wheel is simply turned over and the second set of circular blades is put to use by simply removing the hex nut with wrench provided, removing the round wheel and rotating it left to right. Replace wheel on handle and lock into cutting position with hex nut. 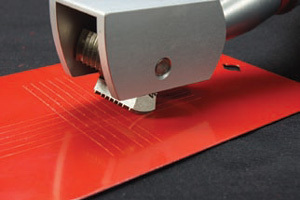 When using the 1.5mm spacing with 8 tooth blades, with the knife edges downward, pull the tool over the painted surface being tested; scratching the coating to the bottom. 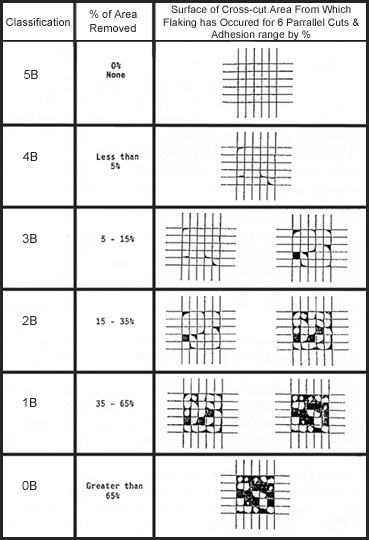 A second crosswise cut (at an angle of 45° or 90°) will produce a ruled area comprising 25 squares or diamonds. Evaluate the appearance or behavior of the coat of paint after some vigorous strokes with the stiff brush provided, or scratching with a fingernail (partial or complete flaking or peeling, no change, etc.). Also note the condition of the substrate (sand-blasted, primed or with a prime coat, degreased, pickled, etc.). Eleven Circular Blades Will Produce 100 Squares in Test Coating. * Permacel #99 test tape no longer available. Currently supplying PA-280630 (51596)Polyester Rope Fiber Laminate tape.